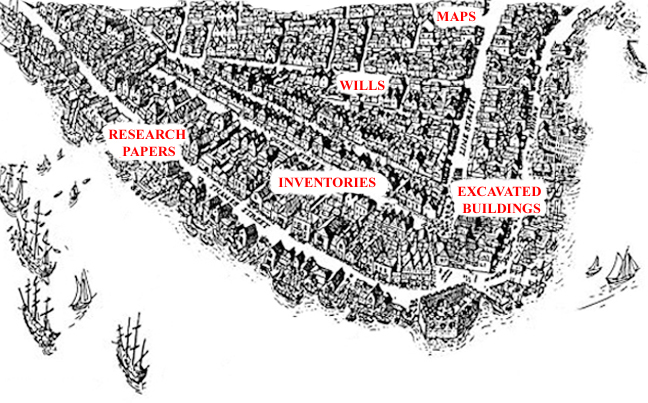 This town plan of Port Royal just before the 1692 earthquake was drawn by Oliver Cox, (Pawson & Buisseret, 2000) an architect in London, England. Last modified May 21, 2001. The contents of this site - text, images, and data - are intended for personal information only. Downloading for private use information or graphic images is not discouraged; however, written permission from the Nautical Archaeology Program is required for the publication of any material. Any use of this material should credit the Nautical Archaeology Program, Texas A&M University. For additional details, contact Donny L. Hamilton (dlhamilton@tamu.edu).